Brooke doesn’t get to exercise all that often. It isn’t for lack of trying: she just doesn’t usually have the time to devote to it. 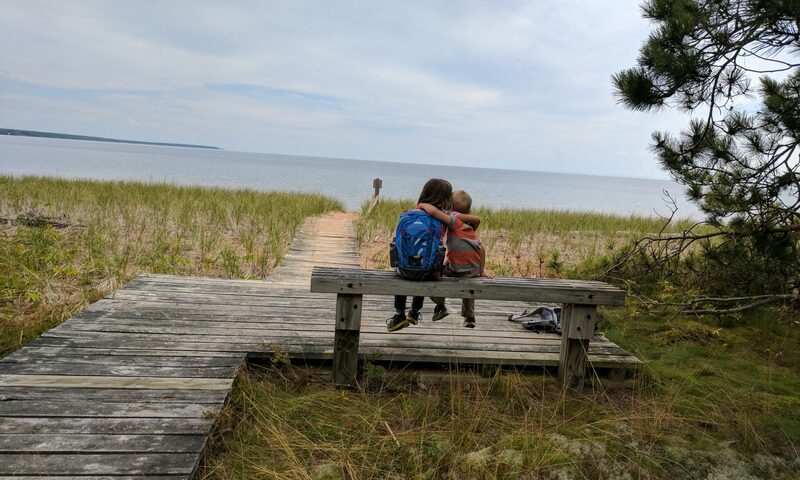 She’s taken her bike down to Sedalia multiple times and she goes hiking at Bothwell with some frequency, but neither of these activities really “speaks” to her. And she totally doesn’t like jogging. However, she’s been interested in getting into kayaking for the last few years. We see folks with boats on their trucks and we know people like going fishing at various places around here. That, and we know that there are some creeks and lakes within driving distance. 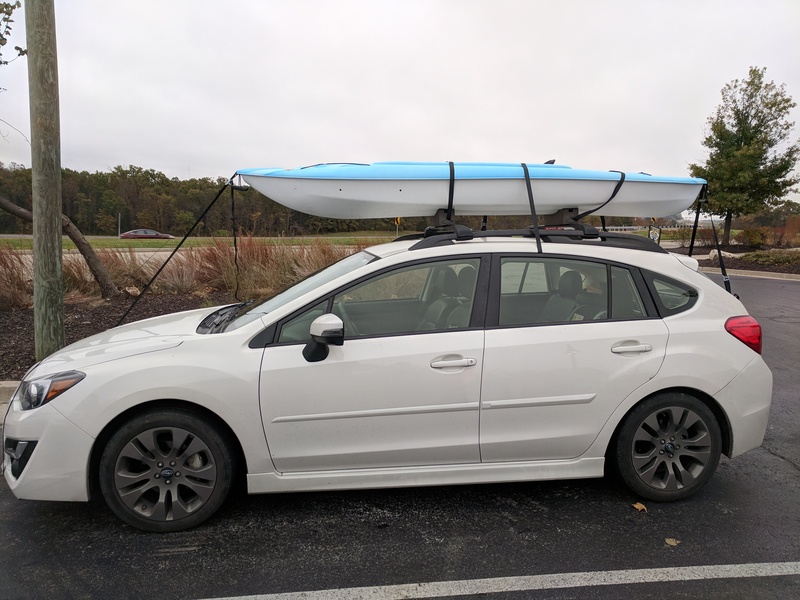 And, we have a few Subarus, so they really have to have a kayak on top of one, right? Anyway, I checked out Craigslist and found a decent deal on a single-person, sit-in kayak that came with a cartop mount. It wasn’t the type of mount we wanted, but at least we could get it home. We went to Columbia and met up with the young woman who was selling it (didn’t have room for it, didn’t use it enough, yadda, yadda, yadda) and picked it up for less than she was asking for. We got it home safe and sound, but with that type of roof mount, it was a hassle to get it up on the top of the car. It took two people, plus it was far easier to get the straps hooked up when you had someone else to toss them to. Thus, if it really takes two people to get on the car, Brooke would never use it. Therefore, we’re going to try the “J hook”-style mount. We picked them up at Amazon for less than $20 and hopefully they work as advertised. 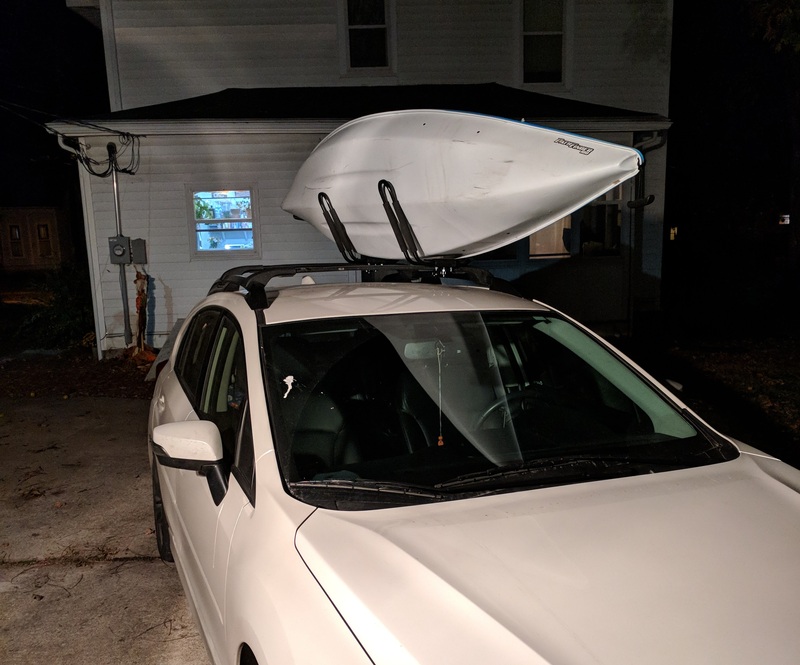 They seem pretty sturdy (though I had to Dremel out the plastic holes to make the screws fit properly), and in theory, the hooks allow ratchet straps to simply cross from the top down to the bottom without requiring one to tie the kayak to the hood or trunk of the vehicle. Of course, the high this week is barely crossing the 50 F mark, so Brooke probably isn’t actually going to get to test this thing out for a few weeks months. I need to find a way to mount it in our garage, too, as sitting on the garage floor isn’t exactly ideal. Hopefully it works out! We figure that resale on a kayak is probably high enough that we won’t lose much money on it, if any. Brooke can lift it down off the car, but she’ll probably want to get a little more practice lifting it up above her head. The J-hook mount should make this easy, as she just needs to get underneath it and “roll” it over onto the roof of the car. Practice will speed up that process, I’m sure.